What is Hosted Anti Spam Software? Hosted anti spam software is an email filtering solution hosted in the cloud by a service provider. Like most cloud-based solutions, hosted anti spam software can be a cost-effective way in which to reduce spam and protect networks against email-borne threats. However, not all hosted anti spam solutions work in the same way; and when it comes to network security, it can be a false economy to cut corners. Spam detection rates represent the percentage of spam emails identified and quarantined by hosted anti spam software. The higher the rate, the better the solution is at detecting spam. The less spam that avoids detection, the better protected networks are against phishing emails and emails harboring malware and ransomware. Real Time Blacklists and SURBL Filters check IP addresses of incoming emails against blacklists of domains known to harbor malware or from which spam is known to have previously originated. Sender Policy Frameworks check incoming emails have originated from a host authorized by that domain´s administrators in order to prevent spoofing. Recipient verification tools check the addresses of each incoming email to ensure they relate to an existing mailbox. These mechanisms are fairly good at detecting spam email, and help some solutions achieve detection rates in excess of 99%. However, failing to detect even 1% of spam emails can result in employees receiving dozens of spam emails each day. Furthermore, due to the increasing sophistication of cybercriminals, this 1% of spam is likely to be the most dangerous. The way to increase spam detection rates and best protect networks against phishing emails and emails harboring malware and ransomware is to implement a hosted anti spam solution that includes greylisting software. Greylisting is a process that returns all incoming emails to their originating servers with a request for the email to be resent. The purpose of greylisting is to identify spam emails from previously unknown sources of spam (as opposed to the RBL and SURBL filters that can only block spam from known sources). The reason greylisting works is because spammers´ servers are often too bust sending fresh spam emails to respond to the greylisting request and the spam email is never resent. Increasing spam detection rates in this manner is a better alternative to increasing acceptable spam thresholds to a level at which genuine emails are quarantined. Although this may be appropriate in some circumstances, a sales department (for example) might actually require a lower acceptable spam threshold in order to prevent sales leads from miscellaneous sources being inadvertently blocked. 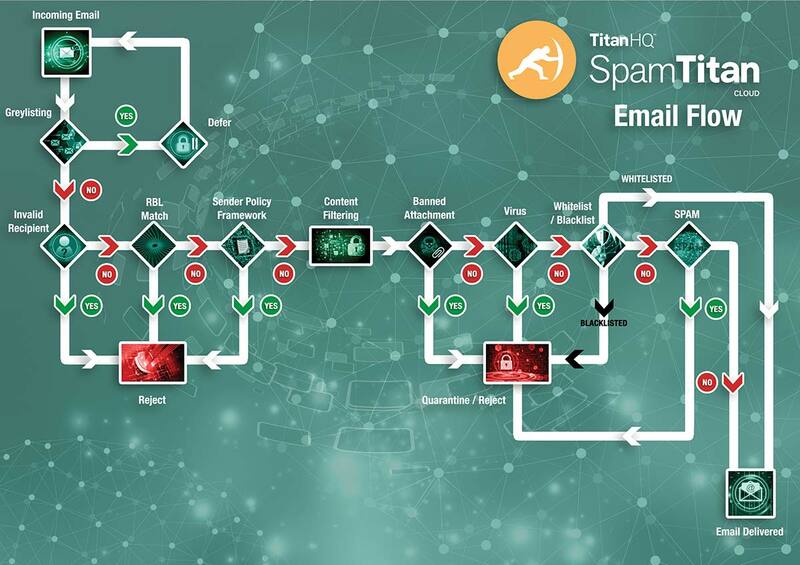 SpamTitan´s hosted anti spam software is an advanced email filtering solution that not only includes Greylisting software, but also the option to run HELO tests and Reject Unknown Sender Domain tests on each inbound email. These mechanisms – along with the standard filtering mechanisms – help SpamTitan achieve a verifiable spam detection rate of 99.97% – one of the highest in the industry. Despite these additional mechanisms, SpamTitan is remarkably easy to use. Domain administrators create an account with SpamTitan, redirect their MX record to our servers, and our hosted anti spam solution is ready to go. There is no hardware to purchase or software to install. Once connected to our servers, administrators manage the solution from a web-based centralized administrative portal. Managing SpamTitan is just as easy. Administrators can apply acceptable spam thresholds by individual user, user-group, or by domain; they can use directory tools such as LDAP to quickly activate the recipient verification tools, and schedule reports to review historically blocked emails in order to identify new threats to the network. Individual quarantine reports are sent to each user as emails are blocked. SpamTitan is universally compatible with all operating systems and infinitely scalable. Our hosted anti spam solution has dual antivirus engines that scan both inbound and outbound email, provides administrators with the option to whitelist trusted domains (in order to avoid delays in the greylisting process), and all updates are performed by us in our IL5-certified data centers. If you feel this is the type of low maintenance solution you would like to use in order to minimize the amount of spam email entering your network, do not hesitate to contact us. Our team of Sales Technicians will be happy to answer any questions you have, and will invite you to take a free trial of SpamTitan without obligation to continue with our service at the end of the trial. Our free trial provides you with the opportunity to experience the high spam detection rates achievable through our hosted anti spam software, and determine the optimum settings for your particular circumstances. At the end of the trial, if you decide to continue using our service, no further configuration will be required, and you can continue can reduce the levels of spam emails received in employees´ inboxes and better protect your network against phishing, malware and ransomware. The best spam filter for business use will depend on the needs of your business and the level of protection you need. The TitanHQ team will be able to advise you on the best solution to deploy.